October 2, 2018 – UBC invited alumni to an evening of discussion and inquiry on the ethics of genetically modified organisms (GMOs). The evening Café Scientifique, titled GMOs in the Global Food System, was held October 2, hosted by the Faculty of Land and Food Systems and its event partners. Listen to an audio recording of the discussion below. Payal Batra (second from right, photo above): Batra is a Post-Doctoral Research Fellow at Kwantlen Polytechnic University who is developing a comprehensive long-term research program in community nutrition and health as it relates to sustainable, bioregional food systems. Batra recently completed her PhD in Nutrition Science from the Friedman school of Nutrition Science and Policy, Tufts University. She has also worked internationally, in India and West Africa, on a range of household nutrition research initiatives. Steven M. Druker (second from left, above): Druker is a public interest attorney who founded the Alliance for Bio-Integrity, a non-profit organization dedicated to promoting technologies that foster human and environmental health. He is a prominent commentator on the risks of genetically engineered foods, and has been featured in numerous articles in newspapers and magazines on five continents. He’s written a book titled Altered Genes, Twisted Truth: How the Venture to Genetically Engineer Our Food Has Subverted Science, Corrupted Government, and Systematically Deceived the Public. He co-authored the introductory and final chapters of Higher Stages of Human Development, and wrote a chapter on ethical development for Transcendence and Mature Thought in Adulthood. 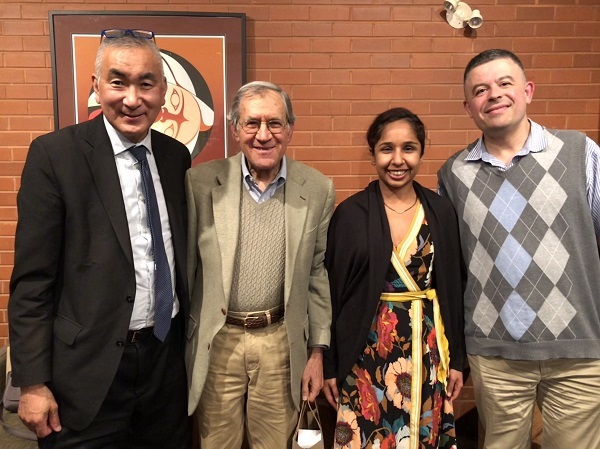 Yves Tiberghien (on the right, above): Tiberghien is a Director Emeritus of the Institute of Asian Research at UBC, Executive Director of the UBC China Council, and Professor of Political Science. He is a Senior Fellow at the Asia-Pacific Foundation of Canada, a Senior Fellow with the Global Summitry Project at the Munk School of Global Affairs at the University of Toronto, and a visiting professor at Tokyo University. He is a Faculty Associate at both EHESS and Sciences Po in France. He is also a Harvard Academy Scholar (2004-2006). Faculty of Land and Food Systems’ Tracy London, Assistant Dean of Development and Alumni Engagement, moderated the discussion while Rickey Yada, Dean (left, photo above), hosted and introduced the animators. Event partners included KPU Institute for Sustainable Food Systems, alumniUBC, UBC Faculty of Arts and St. John’s College.